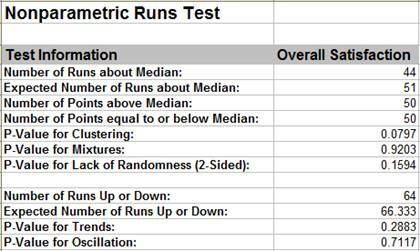 How Do I Perform a Nonparametric Runs Test in Excel Using SigmaXL? Click SigmaXL > Statistical Tools > Nonparametric Tests > Runs Test. Ensure that the entire data table is selected. If not, check Use Entire Data Table. With all of the p-values being greater than 0.01, we fail to reject H0, and conclude that the data is random (or statistically independent). Recall from the run chart of this data that there were no obvious trends or patterns. 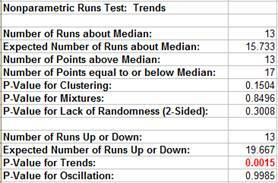 Examples of Clustering, Mixtures, Trends, and Oscillations are given below using the Run Chart to illustrate. The data for these examples are given in the file Runs Test Example Data.xls. (Use SigmaXL > Graphical Tools > Run Charts to create the run charts). Clustering appears as a group of points in one area of the chart. It may indicate special cause variation such as sampling or measurement problems. Mixtures appear as an absence of data points near the center line. A mixture may indicate a bimodal distribution due to a regular change of shift, machinery, or raw materials. 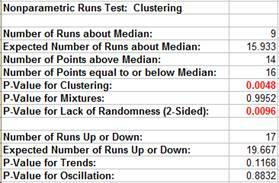 Note that the p-value for Mixtures = 1 – p-value for Clustering. They are mutually exclusive. The p-value for Lack of Randomness = 2 * minimum of (p-value Clustering, p-value Mixtures). Trends appear as an upward or downward drift in the data and may be due to special causes such as tool wear. Oscillations appear as rapid up/down fluctuations indicating process instability. Note that the p-value for Trends = 1 – p-value for Oscillation. They are mutually exclusive.